Recent environmental and corporate governance failures in Brazil and their economic impact have focused the attention of investors, regulators and policymakers more closely on corporate governance issues and the need for greater transparency in financial markets. In response to these concerns, the Principles for Responsible Investment (PRI), UNEP FI and The Generation Foundation have launched a Brazil Roadmap, also available in Portuguese, following on from their flagship project, Fiduciary Duty in the 21st Century, which concluded that failing to consider long-term investment value drivers including environmental, social and governance (ESG) issues, in investment practice is a failure of fiduciary duty. Find more information about the Fiduciary Project here: www.fiduciaryduty21.org. 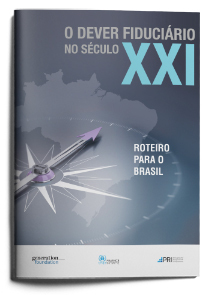 Download the Brazil roadmap, and similar reports that have recently been released on Australia, Canada, UK and US here.